Who will win Round One in the East? 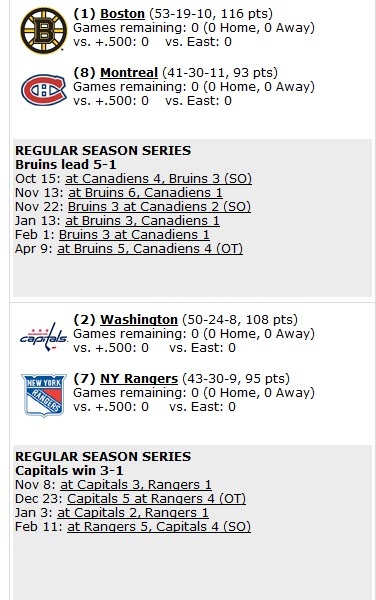 For everyone's easy reference, here are the matchups and head-to-head season records in the Eastern Conference. Here's also a quickie poll, to see where our GM Members stand at glance. I've set it up for your multiple choices for each matchup, so hopefully that works. Aren't there too many polls already? marakh wrote: Aren't there too many polls already? Did you ever meet a hockey poll you didn't like? The percentages in the poll are a little confusing lol. Boston over Montreal is 25%, which is 3-0. I guess there's no way to set the poll total to 400%. Oh, well, I've adjusted to Fahrenheit and Imperial measures, I can do this. 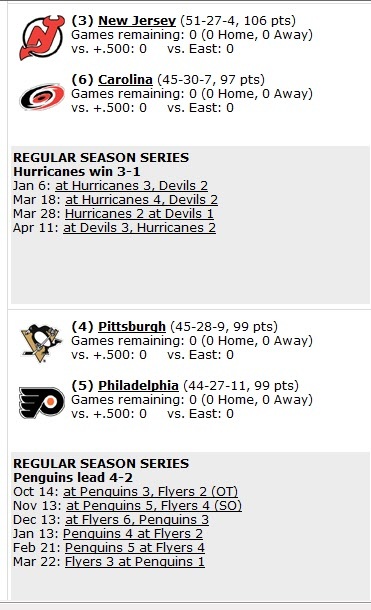 I'm a little surprised that everyone (so far) picked Carolina over the Devils. Not that I disagree (obviously) but I thought my pick was at least a little unconventional. I picked Boston, Washington, Jersey, and Pittsburgh, the first two were easy for me, Boston and Washington should both have an easy time with their opponents, the only hinderance to Washington might be Avery's antics and King Henrik, but Washington has way too much fire power to lose. Boston, no brainer, they are better at every part of the game than Montreal is, be interesting to see who Gainey puts between the pipes, Price has been awful lately, Halak has been steady, but yet Price consistently gets the call. The other two were a bit harder to predict, Jersey has Brodeur and that alone should give them the edge, but Carolina has been playing some great hockey lately, should be a 6 game series, all games close. The same goes for Pittsburgh and Philly, a tough one to call, Pittsburgh depth and the guidance of Bill Guerin should be enough to pull this one out, if Philly pulls this one out, its because they wear Pittsburgh down by being on the body at all times and Jeff Carter having a great series. That's my 2 cents. ...the Devs-Canes series should be fun...as the last time they met, the winner of their series (the '06 conference semis)...went on to win the Cup. I believe that was a Ward-Brodeur battle as well. shabbs wrote: Holy poll madness batman! the poll bug hit DTR and I am loving it, you all have to see my opinion now, doesn't mean you have to agree with it lol. have to agree with you on that one, nothing beats over analyzing playoff series' lol.